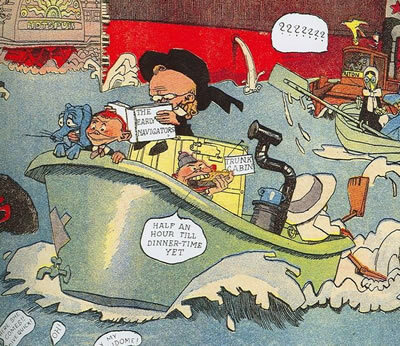 A lot of nice stuff linked to today from a Spanish blog I ran across called Tras Las Turquesas Cortinas, including Lyonel Feininger, George Herriman, Al Capp and a lot more. The best way to check it out is to just go to the site and explore. Above is a crop from one of the marvelous Feininger Kin-Der Kids strips reprinted there.